We were handling a 57-year-old Indonesian woman who came to the emergency room with palpitation. The patient had no history of heart disease, diabetes mellitus, pulmonary, or hypertension. On examination, she was conscious with blood pressure of 120/80 mmHg, radial artery pulse of 102 bpm (irregular), heart rate of 135 beats/min (irregular), and temperature of 36.8°C. The electrocardiogram showed atrial fibrillation (AF) with QRS rate of 160 bpm, normal axis, with multiple P wavelets, QRS duration of 0.08 s, ST-segment deviation (−), T-inverted (−), Left ventricular hypertrophy (LVH) (−), Right ventricular hypertrophy (RVH) (−), and Bundle branch block (BBB) (−). The patient was diagnosed as unstable rapid ventricular response AF. The patient was under consideration to be converted from AF to sinus rhythm using electrical cardioversion. We are wondering if there is a thrombus in left atrial appendage (LAA) or risk of thromboembolic events. Transesophageal echocardiography (TEE) and magnetic resonance imaging (MRI) are not available because of the work in remote area. TEE is the modality of choice for the evaluation of LAA because of its capability of showing complete delineation of LAA. However, TEE is only available in very limited hospitals in Indonesia, and the availability of the operators trained to do the examination is very limited. Therefore, the need for readily available and cost-effective marker is needed to substitute TEE modality. Mean platelet volume (MPV) is one of the newly investigated biomarkers which are associated with thrombosis and inflammation; the larger the volume, the higher the risk of thrombosis. The nature of the biomarker was also found to have an effect on identifying the risk of thrombus formation and thromboembolic event originating from the left atrium, especially in mitral regurgitation, mitral stenosis, and AF.,,, This study aimed to evaluate MPV as a novel biomarker for identifying the risk of thrombosis compared to TEE as the gold standard examination. Can MPV perform well as a new biomarker in the presence of thrombus in nonvalvular AF compared to TEE? 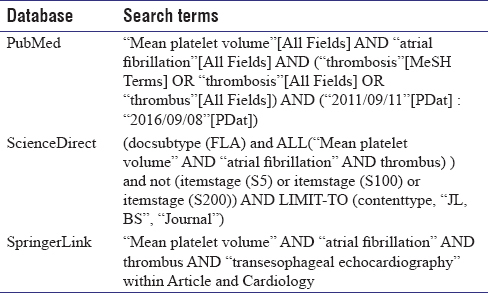 Literature search was performed in the databases of PubMed, ScienceDirect, and SpringerLink [Table 1]. Inclusion and exclusion criteria were used to screen the literature. Literature appraisal was conducted using critical appraisal sheets provided by the Centre for Evidence-Based Medicine. Test characteristic was extracted from the literature. Meanwhile, sensitivity, specificity, positive predictive value, and negative predictive value (NPV) were calculated based on the test characteristic. Through search and elimination process, two studies were selected to be appraised in this study. One study was conducted in China, while the other was conducted in Portugal. Both the studies have significant different characteristics in terms of subject's race and sample size. Study design, study population, proposed diagnostic test, comparator, and outcomes are summarized in [Table 2]. Considering the result of appraisal study, both of the studies were considered as passable to be used in this study [Table 3]. Both studies used the same proposed diagnostic test with different cutoff [Table 2]. The study by Providência et al. used MPV >9.4 fL as the cutoff, while the study by Xu et al. used MPV >10.5 fL as the cutoff value. As for the standard reference, Providência et al. used TEE as the only standard reference to determine the outcome, and in contrast, Xu et al. used the combination of brain computed tomography (CT), TEE, ultrasonic cardiogram, diffusion-weighted MRI (DW-MRI), and pulmonary vein imaging as the reference standard. The reason that Xu et al. used brain CT, DW-MRI, and even pulmonary vein imaging was to determine the thromboembolic event in addition to determine whether or not thrombus was present in the left atrium. Meanwhile, Providência et al., using the TEE, tried to determine the left atrial (LA) abnormality which comprised at least one of the following: LAA thrombus, dense spontaneous echo contrast, and low flow velocity (≤20 cm/s). Characteristics of the included studies are presented in [Table 2]; the validity of the proposed diagnostic tool is measured by sensitivity, specificity, positive predictive value, and NPV [Table 4]. The study conducted by Providência et al. with MPV cutoff value of >9.4 fL showed a rather poor sensitivity (54.1%) and positive predictive value (43.41%); furthermore, the specificity (63.35%) and NPV (72.65%) were considered fair. Contrary to the results gained from Providência et al., Xu et al. showed more stable results in sensitivity (78.5%), specificity (77.59%), positive predictive value (77.19%), and NPV (78.95%). In addition, based on the multivariate logistic regression of the predictors, the odds ratio (OR) represented in the study of Xu et al. (OR = 3.1, 95% confidence interval [CI]: 1.6–5.1, P = 0.000) was higher than that in the study of Providência et al. (OR = 2.656; 95% CI: 1.063–6.633, P = 0.036). There are several biomarkers which were studied to determine the presence of thrombus in the left atrium, such as uric acid, brain natriuretic peptide, and C-reactive protein.,,, MPV is relatively a new biomarker compared to others. Besides in AF, MPV was also studied as the biomarker for thrombus or thromboembolic risk in sinus rhythm with mitral stenosis; however, the number of studies was less than in AF. The main goal of this study was to find a replacement of TEE or MRI to predict the presence of thrombus in the LA or LA abnormality, which are usually not readily available in remote hospital. Therefore, the most useful indicator mentioned in [Table 4] for this purpose is the NPV. NPV showed how many of the negative tests are “truly negatives.” Therefore, the higher the percentage of NPV, the better it represents the gold standard. Looking at this case, if the patients have MPV ≤9.4 fL, the possibilities of there is no abnormality in the left atrium is 72.65% based on the study by Providência et al. ; meanwhile, Xu et al. showed that if the MPV was less than or the same with 10.5 fL, the possibilities of there is no risk of thrombus or thromboembolic event was 78.95%. Relating to the illustrated case, there is still a risk of “false negative” about 10%–20% of the cases which can lead to the occurrence of thromboembolic event if electrical cardioversion was considered to be done only using MPV as the newly proposed biomarker. From the current standpoint, using MPV as a single biomarker to determine the presence of thrombus in LAA or the risk of thromboembolic event is still precarious; therefore, it still cannot replace TEE as the gold standard to determine the presence of LA thrombus. In the bright side, the NPVs of MPV were fairly high based on the appraised studies. The value of NPV might possibly be improved by more studies to determine the better cutoff point for MPV and also by combining with another biomarkers or with clinical prediction rules such as congestive heart failure, hypertension, age ≥75 years, diabetes mellitus, stroke/transient ischemic attack (CHADS2) score; congestive heart failure, hypertension, age ≥75 (doubled), diabetes mellitus, prior stroke or transient ischemic attack (doubled), vascular disease, age 65–74, female (CHA2 DS2- VASc) score; and renal dysfunction, congestive heart failure, hypertension, age, diabetes, stroke/transient ischemic attack (R2 CHADS2) score. MPV is a new biomarker for LAA thrombus or thromboembolic event with great potential. Currently, the optimal MPV cutoff value for determining the absence of thrombus in the left atrium is 10.5 fL. Although currently it is not clinically ready, it can further be improved by more studies to determine the optimal cutoff value and to increase the value of MPV by combining with other biomarkers and clinical prediction rules. Stöllberger C, Schneider B, Finsterer J. Elimination of the left atrial appendage to prevent stroke or embolism? Anatomic, physiologic, and pathophysiologic considerations. Chest 2003;124:2356-62. Morady F, Zipes DP. Atrial fibrillation: Clinical features, mechanisms, and management. In: Bonow RO, Mann DL, Zipes DP, Libby P, editors. Braunwald's Heart Disease. 9th ed. Philadelphia: Elsevier Saunders; 2012. p. 825-44. Bansal M, Kasliwal RR. Echocardiography for left atrial appendage structure and function. Indian Heart J 2012;64:469-75. Dinarti LK, Soesanto AM. Pemeriksaan trans-esophageal echocardiografi. J Kardiol Indones 2010;31:148-50. Ulu SM, Ozkeçeci G, Akci O, Ahsen A, Altug A, Demir K, et al. Mean platelet volume, in predicting severity of mitral regurgitation and left atrial appendage thrombosis. Blood Coagul Fibrinolysis 2014;25:119-24. Xu XF, Jiang FL, Ou MJ, Zhang ZH. The association between mean platelet volume and chronic atrial fibrillation and the presence of thrombotic events. Biomed Rep 2015;3:388-94. Providência R, Faustino A, Paiva L, Fernandes A, Barra S, Pimenta J, et al. Mean platelet volume is associated with the presence of left atrial stasis in patients with non-valvular atrial fibrillation. BMC Cardiovasc Disord 2013;13:40. Gülcihan Balcı K, Maden O, Balcı MM, Şen F, Ünal S, Kuyumcu S, et al. The association between mean platelet volume and spontaneous echocardiographic contrast or left atrial thrombus in patients with mitral stenosis. Anatol J Cardiol 2016;16:863-7. CEBM. Critical Appraisal Tool Oxford: University of Oxford; 2016. Available from: http://www.cebm.net/critical-appraisal/. [Last updated on 2014 Jun 01; Last accessed on 2016 Sep 07]. Ederhy S, Di Angelantonio E, Dufaitre G, Meuleman C, Masliah J, Boyer-Chatenet L, et al. 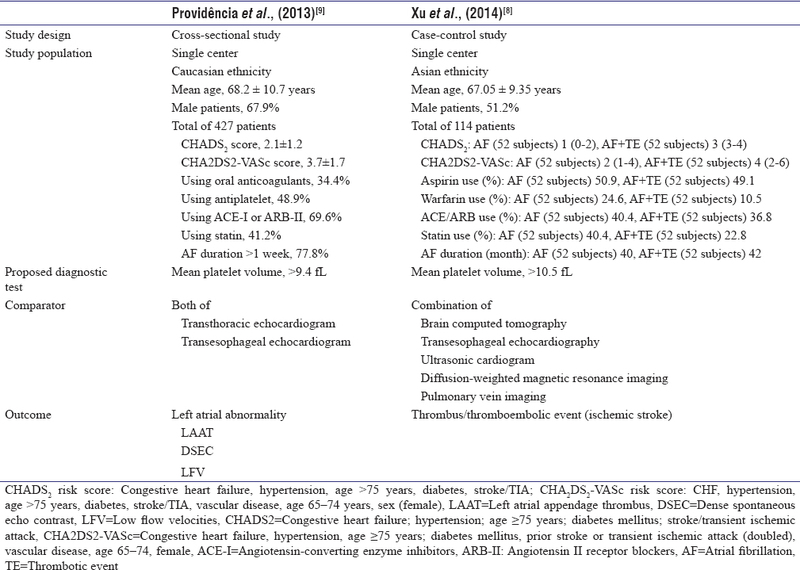 C-reactive protein and transesophageal echocardiographic markers of thromboembolism in patients with atrial fibrillation. Int J Cardiol 2012;159:40-6. Yoshida N, Okamoto M, Hirao H, Suenari K, Nanba K, Uchida M, et al. High plasma human atrial natriuretic peptide and reduced transthoracic left atrial appendage wall-motion velocity are noninvasive surrogate markers for assessing thrombogenesis in patients with paroxysmal atrial fibrillation. Echocardiography 2014;31:965-71. Shimizu H, Murakami Y, Inoue S, Ohta Y, Nakamura K, Katoh H, et al. High plasma brain natriuretic polypeptide level as a marker of risk for thromboembolism in patients with nonvalvular atrial fibrillation. Stroke 2002;33:1005-10. Ozturk D, Celık O, Akın F, Akturk F, Aslan S, Ozyılmaz SO, et al. Usefulness of the uric acid and CHA2 DS2-VASc score in prediction of left atrial thrombosis in patients with mitral stenosis and sinus rhythm. Cardiol J 2015;22:336-42. Parikh R, Mathai A, Parikh S, Chandra Sekhar G, Thomas R. Understanding and using sensitivity, specificity and predictive values. Indian J Ophthalmol 2008;56:45-50. Kornej J, Hindricks G, Kosiuk J, Arya A, Sommer P, Husser D, et al. Comparison of CHADS2, R2CHADS2, and CHA2DS2-VASc scores for the prediction of rhythm outcomes after catheter ablation of atrial fibrillation: The Leipzig Heart Center AF ablation registry. Circ Arrhythm Electrophysiol 2014;7:281-7.